Our Goat Formula is 50% lower in fat than beef and 40% lower in saturated fat than chicken. That makes it one of the healthiest meat options for your dog. 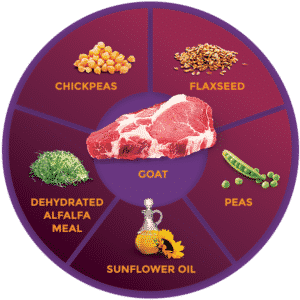 It’s also a novel protein source, and together with a grain free recipe, our Goat Formula is a great option in elimination diets for dogs with food sensitivities or allergies. Goat is the most popular and widely-enjoyed meat in the world. It is also one of the most nutritious protein sources, packed with vitamins, minerals, and essential nutrients. Zignature® Goat Formula – Learned from Nature, Crafted to Perfection. Goat, Water, Goat Lungs, Goat Liver, Peas, Chickpeas, Agar-Agar, Tricalcium Phosphate, Calcium Carbonate, Potassium Chloride, Salt, Sunflower Oil, Choline Chloride, Minerals (Zinc Proteinate, Iron Proteinate, Copper Proteinate, Manganese Proteinate, Sodium Selenite, Calcium Iodate), Vitamins (Vitamin E Supplement, Thiamine Mononitrate, Niacin Supplement, Calcium Pantothenate, Biotin, Vitamin A Supplement, Riboflavin Supplement, Vitamin B12 Supplement, Pyridoxine Hydrochloride, Vitamin D3 Supplement, Folic Acid) , L-Carnitine.